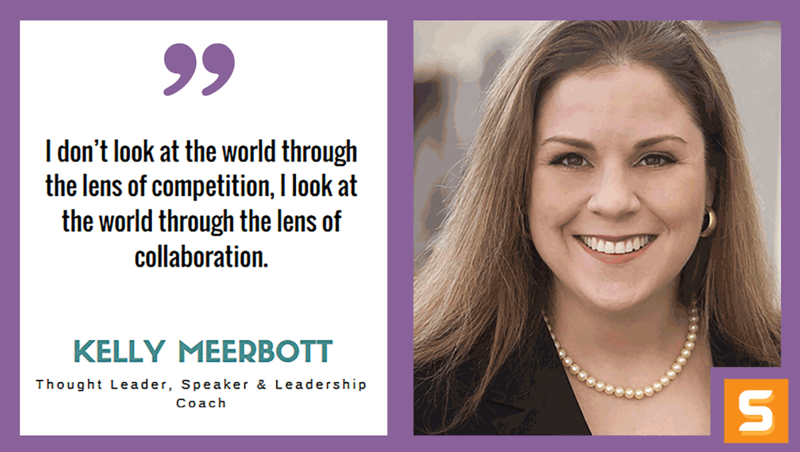 Kelly Meerbott is a respected thought-leader, speaker and leadership coach to corporate executives. Through working with executives in powerful positions, Kelly learned that although these men and women knew how to run businesses, they still had obstacles thwarting their bigger vision. Kelly guides her clients through a customized change management process to improve company morale, improve productivity, achieve higher profits, streamline communications processes and eliminate politics. Meerbott is a guest columnist for the Philadelphia Business Journal, a host for Executive Leaders Radio, a featured speaker for Philly Tech in Color, featured in Inside Business, A Band of Wives, MilitaryOneClick.com, and HearSay with Cathy Lewis. She's one of Linkedin’s top recommended professionals, an expert on Evisors.com, on Forward Metrics and Noomii.com as well. Kelly earned a B.A. in English literature from the College of the Holy Cross in Worcester, MA. and completed post-graduate work in emotional intelligence from Case Western Reserve University, modern psychology from Princeton University, and leadership development from the University of Pennsylvania. She's currently at work on her first book that addresses the struggles of people in power. In this interview, Kelly describes how she got into entrepreneurship and coaching practice. She also shares what makes her proud as a leader and fulfilled as a business coach. Hire the best accountant you can afford. Hire the best attorney you can afford. Surround yourself with people smarter than you, think differently than you do and are willing to provide honest feedback. Can you tell us a little bit about yourself, Kelly and HOW YOU GoT STARTED as an entrepreneur? I had been laid off. Well, to be more precise, me and my 29,999 colleagues across the world had been part of the company’s first round of downsizing. As I took the envelope from his hand and walked out of his office, thoughts flooded in: "Wait! This cannot be happening!" and "I’m a senior sales and marketing consultant whose trained hundreds of people, recovered millions of dollars and saved dozens of key accounts for this company." and "I’ve helped convert businesses that hated working with us into raving fans, coached my colleagues, become a trusted advisor to hundreds of business owners and executives." and "I’ve sacrificed so much of myself to create a successful corporate career, and now it’s being ripped away from me!" Getting from Terry’s office to my cubicle was like walking through Jell-O. I picked up a few things from my desk and was escorted out of the building. I don’t remember the drive home. I do remember thinking, “How do I get in touch with Brian?” My husband of six months was on a voluntary deployment with the U.S. Navy to Guantanamo Bay. He had no idea what was going on with me, and I had no way of getting in touch with him. When I got home, I collapsed in a shame-filled puddle of tears and confusion on our couch, and that’s where I stayed for the next seven days. I didn’t shower. I didn’t eat. I got up only to take care of our dogs, then I would resume the fetal position and succumb to victim-thinking and the blame spiral: Why me? What did I do wrong? I wasn’t just wallowing in my self-pity, I was bathing in it. I knew I had to do some internal work on myself. My confidence was shaken, and I needed to rebuild myself. I went to Steve Chandler’s website. Steve is the author of 30 books that have been translated into more than 25 languages. His personal success coaching, public speaking and business consulting have been used by CEOs, top professionals, major universities and more than 30 Fortune 500 companies. I bought his 12-CD success course, “Mindshift.” With the purchase of the course, I got a free 90-minute phone coaching session with a coach named Charrise McCrorey. I reached out to Charrise and scheduled the call immediately. Several days later, on my coaching call with Charrise, I was telling her my sob story about being laid off. I was going on and on about how terribly I had been treated, fully immersed in my victim story. Charrise listened quietly, and about 45 minutes into my rant she asked, “Kelly, are you open to some coaching around this?” I responded: “Of course!” Charrise said, “I think you’re a victim and you need to take ownership of your life.” Another statement that knocked the wind out of me! I immediately jumped to the defensive, “%$#@ you, Charrise!” I shouted and hung up the phone. Actually, I think I slammed it. Is she right? Is there any truth to what she said? When I looked down at my watch I noticed I had 45 minutes left on our call. I knew this was my chance to turn my life around and create what I wanted for my life and family. So, I picked up the phone and called Charrise back. I apologized immediately and asked if we could continue our work. It was the beginning of three and a half years of intense introspection that changed the trajectory of my life. During that time, Charrise kept pushing me out of my comfort zone like every good coach does, and I found myself working for my certificate to become an executive coach. Once I finished that process in 2010, I began to give others the gift that Charrise gave me. The gift of coaching. What I noticed was how happy I was conducting conversations that mattered with my clients. I loved seeing their potential and watching them rise up to meet a challenge. My husband, Brian was extremely supportive from the beginning, and our relationship deepened as I became more self-actualized. Two years after Terry fired me, I wrote him a thank-you note saying, “Thank you for giving me the greatest gift one human being can give another: their life’s purpose.” I am living my dream of holding executives and their businesses accountable to the best versions of themselves. February 2010, when I paid my business taxes for the first time. I knew if I owed the IRS a tax payment I made money. It was at that moment that my mind shifted from coaching as a hobby to coaching as a business. Over the past 8 years, I have a folder full of emails from people who were clients or prospects whose lives were changed by one conversation we had together. I love the freedom to create and be nimble. I'm able to respond to the needs of a client or prospect quickly and efficiently. I enjoy being able to work as much or as little as I want to, where I want to and when I want to. It’s fun and exciting to constantly reside in the realm of creation vs. reaction. Is there something you are most proud of? There are so many things I'm proud of. I’m proud of my clients and all the hard work they put in to achieve the businesses of their dreams on a higher level of consciousness. I’m proud that the business I unexpectedly created in 2009 during the worst recession in our country’s history has survived and thrived for eight years when most businesses fail the first year. I’m proud that I’ve created a business with a high level of integrity, compassion, empathy and have never compromised on those tenets. I’m proud that I was invited to be a member of the Forbes Coaches Council. I’m proud that I was asked to speak at the PA Conference for Women this year. I’m proud that I get to do work I love with people I love who are changing the world not just by doing what they are doing but by who they are being in the world. The only competitive advantage I have over the rest are the unique gifts and talents I bring to the world. I don’t look at the world through the lens of competition, I look at the world through the lens of collaboration. In personal and professional development, it’s all about the greater good of all concerned. How do you balance life and work to remain connected and available for your loved ones? Any advice? I put my phone on do not disturb from 7 p.m. - 7 a.m. That’s my time to be with my family and be fully present. I practice very strong boundary setting (notice I said: “practice” because I haven't perfected this yet). I’ve also learned to fall in love with the word “No.” Anytime an opportunity is presented to me I meditate on it and if my response to the opportunity is a HELL YES! Then I’ll do it. If not, then it’s a no. Gandhi said, “a ‘no’ uttered from deepest conviction is better and greater than a ‘yes’ merely uttered to please or worse to avoid trouble." Because time is finite, if you say yes to something it’s often a no to something else. I’m fiercely protective of my time so I want to make sure the opportunity is well-worth spending my time on. What is the toughest decision you’ve ever made when starting a business? How did it make you better at the end of the day? Walking away from a very large and lucrative client because their core values weren't in alignment with my core values. My integrity is non-negotiable and I will not compromise it for any amount of money. It was a scary moment for me because the money would've been a game-changer but at the end of the day, no amount of money is ever worth it. What do you consider the biggest milestone that you have hit with your business? What was the number one thing you did to get there? Hiring my business manager, Rebekah Quintana in July of 2015. The number one thing I did to get there was making the decision to create enough revenue to make that hire. There is no secret sauce to success, it’s a mixture of hard work, commitment, persistence, patience and focus. If you have all of those components there's no way you can possibly fail. It doesn’t because I don’t let it. I’ve made at priority from the beginning of my entrepreneurial career to strike a strong balance between work and my personal life. Please see the answer to question one. I would say there were two: 1) Steve Chandler & 2) Charrise McCrorey. What are the top 3 pieces of advice that you would give someone starting a business in Pennsylvania? What do they need to know from the beginning? Hire the best accountant you can afford. Someone who is a true partner in your business and is patient enough to explain the ins and outs of business taxes. Hire the best attorney you can afford. Someone who is a true partner in your business and is patient enough to explain the ins and outs of business law. Surround yourself with people smarter than you, think differently than you do and are willing to provide honest feedback. The more diverse your network the better. To get updates from Kelly, follow her on Twitter. And if you want to schedule a consultation, contact her at Kellymeerbott.com/contact.